NEW YORK — Police say Donald Trump Jr.’s wife opened an envelope that contained white powder, felt ill and was taken to New York City hospital as a precaution. A police department spokesman says a preliminary test of the powder indicated it wasn’t dangerous. 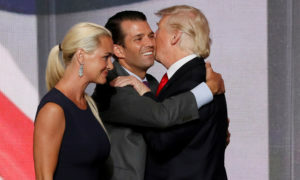 They say Vanessa Trump called 911 Monday morning after opening a letter addressed to Donald Trump Jr. at their midtown Manhattan apartment. Police say she said she was coughing and felt nauseous. The Trump Organization didn’t immediately respond to a request for comment. It’s unclear what the powder was.